It's no secret that spring is one of the most exciting times of the year for interior designers, as they can leave behind the drab neutrals of winter and embrace the bold and beautiful hues of the season. While many individuals opt to completely renovate the space with a bold new bathroom vanity and an array of bathroom accessories, even the finest modern washroom furnishings can fall flat without the right personal touches. If you're looking for a quick and easy focal point for the room, arranging a centerpiece is a fabulous step in the right direction. Here are a few design ideas to incorporate into your display. If you're going for a one-size-fits-all approach to the room, simply pick up a large dish, cake dish or another large vessel and put an array of spring accents together. Everything from fresh-cut flowers, colored eggs and other bits of greenery will have a huge impact on your space. These arrangements are a striking addition to any washroom with a dual-sink vanity and can provide balance for the room. According to MarthaStewart.com, searching through flea markets and antique shops for unique flower holders can add a vibrant touch to your bathroom. 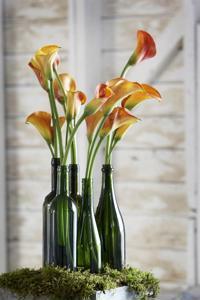 Keep an eye out for old watering cans, wine or milk bottles or a few beach pails that can be reinvented as floral vases. This will show off your decorative ingenuity and give your guests a taste of seasonal flair as well. The traditional egg dishes that are meant for single hard-boiled eggs can act as fabulous backdrops for decorative endeavors. You can opt to hollow out a colored egg to hold a series of small flowers or use them as a tea light holder. These tiny additions will scream spring and give your bathroom a touch of personality. Be sure to arrange a few of these egg holders to improve the visual appeal of your arrangement. When looking to showcase your DIY handiwork, tin can vases are fabulous additions to your bathroom's interior design, suggests Country Living magazine. Simply decorate the outside of the cans with a design of your choice, and then fill them with a selection of fresh flowers. This can also work beautifully with mason jars and other leftover kitchen containers that can give your bathroom a sustainable quality that guests will appreciate.